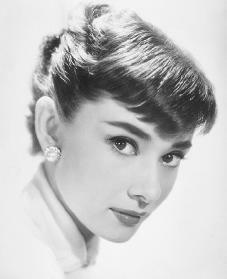 Audrey Hepburn was a popular movie actress who won an Academy Award in 1954 for her work in Roman Holiday. She also worked with the United Nations to improve the lives of the poor, especially children. Audrey Hepburn was born in Brussels, Belgium, on May 4, 1929, the daughter of J. A. Hepburn-Ruston and Baroness Ella van Heemstra. Her father, a banker, deserted the family when she was only eight years old. Hepburn was attending school in England when the Germans invaded Poland at the start of World War II (1939–45; a war fought mostly in Europe, with Germany, Italy, and Japan on one side and the United States, Great Britain, France, and the Soviet Union on the other). England had promised to help Poland, which they did by declaring war on Germany. Hepburn's mother took her to live with relatives in Holland, thinking they would be safer there. The Germans soon invaded Holland, though, leading to the deaths of many of Hepburn's relatives and forcing her and her mother to struggle just to stay alive. Sometimes she had nothing to eat except flour. Still, as a young ballet dancer, she performed in shows to help raise money for the Dutch war effort. Hepburn and her mother moved to England after the war, and she continued to pursue her dance career. She was cast in bit parts on stage and in films in both Holland and England before being discovered in 1952 by the French novelist Colette (1873–1954) in Monte Carlo, Monaco. Colette insisted that Hepburn play the lead role in the Broadway production of her novel Gigi. Although Hepburn's lack of experience was a problem at first, she improved steadily, and reviews of the show praised her performance. She also won a Theatre World Award for her work. Hepburn's nationwide exposure in Gigi also brought her to Hollywood's attention. She was given a starring role in Paramount Studios' Roman Holiday. Costarring Gregory Peck (1916–), the 1953 film tells the tale of a runaway princess who is shown around Rome, Italy, by a reporter who falls in love with her. He then convinces her to resume her royal duties. The role landed Hepburn an Academy Award for best actress at the age of twenty-four. Hepburn was now highly sought after. Director Billy Wilder (1906–2002) signed her up in 1954 for his new film, Sabrina. The movie was about a chauffeur's (someone who is paid to drive a wealthy person's car) daughter whose education in France makes her the toast of Long Island, New York, society. Hepburn costarred with William Holden (1918–1981) and Humphrey Bogart (1899–1957), who was her love interests in the film. Awards in addition to the one she won for Roman Holiday. After 1967's spooky Wait Until Dark, in which she plays a blind woman being pursued by a killer, Hepburn stopped working for a while. Acting became secondary in her life, as she bore a child at age forty during her thirteen-year marriage to Italian physician Andrea Dotti. Hepburn chose to spend her time with her two sons and work for the international children's relief organization UNICEF. "If there was a cross between the salt of the earth and a regal queen," actress Shirley MacLaine (1934–) told People magazine, "then she was it." Hepburn made only four more movies between 1976 and 1989. The last, Always, featured her in a brief role as an angel. Money was not an issue; besides her own income, Hepburn lived in Switzerland with Robert Wolders, the wealthy widower of actress Merle Oberon (1911–1979), for the last twelve years of her life. Hepburn continued her work for UNICEF and was named the organization's goodwill ambassador (representative) in 1988. Hepburn worked in the field, nursing sick children and reporting on the suffering she witnessed. Hepburn traveled to Somalia in 1992, and her sad but hopeful account focused worldwide attention on the famine and warfare that would eventually kill thousands in that West African country. Shortly before her death in January 1993, Audrey Hepburn was given the Screen Actors Guild award for lifetime achievement. Unable to accept in person, she asked actress Julia Roberts (1967–) to accept the honor in her place. While Hepburn's acting was highly appreciated in her lifetime, she would probably rather be remembered as UNICEF's hardworking fairy godmother. Keough, Pamela Clark. Audrey Style. New York: HarperCollins, 1999. Paris, Barry. Audrey Hepburn. New York Putnam, 1996. Walker, Alexander. Audrey: Her Real Story. New York: St. Martin's Press, 1995. Woodward, Ian. Audrey Hepburn. London: W. H. Allen, 1984.